WestEdge is a 50 acre mixed use development underway in the heart of downtown Charleston in close proximity to MUSC, Roper St. Francis Healthcare, the College of Charleston and The Citadel. The site is bound by US17, Lockwood Blvd., Fishburne Street and Hagood Avenue. The WestEdge development will consist, when complete, of nearly three million square feet of space made up of 1,500 residential units, 900,000 SF of office space, 300,000 SF of retail space and 1,000 hotel rooms. Projects within WestEdge currently under construction include 350 high-end residential units, 235 high-end apartment units, 85,000 square feet of retail of which 60,000 square feet is already leased. The immediate area also boasts Brittlebank Park, Joe Riley Stadium, four name brand hotels and the City Marina. Access to the site will be excellent. 250,000 individuals live within 20 minutes of the development. Most commuters from Mt. Pleasant, North Charleston and James/Johns Island can reach the site within 20 minutes. 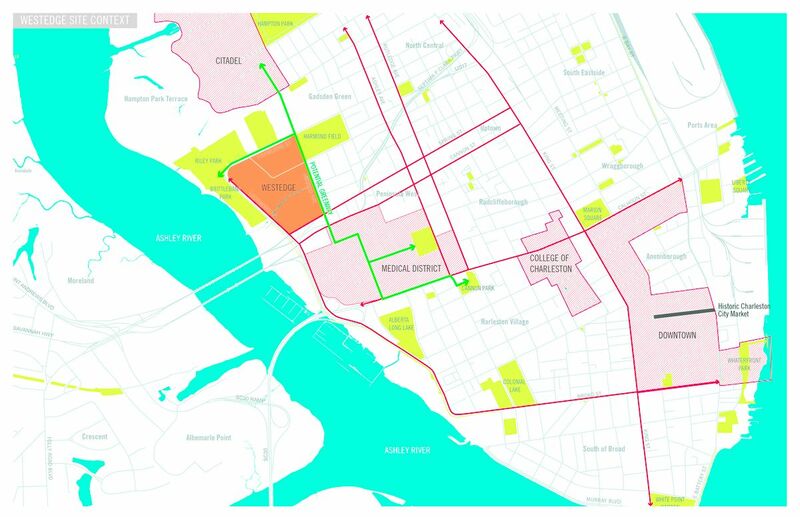 The location of the site will dramatically lower travel times for workers as compared to the office buildings south of Calhoun Street on the peninsula. Parking will be accommodated in the adjacent private parking deck. 22 WestEdge will be an eight story office tower with ground floor retail which will be the tallest and most modern of its kind in Charleston. The first floor will consist of 15,973 SF of highly visible retail space and the upper seven floors of office will encompass 139,385 SF of Class A office with unparalleled views of the city and the Ashley River. The retailers will have large glass storefronts with the ability to take advantage of the wide sidewalks in front of the building. Office tenants will park in the immediately adjacent garage at 10 WestEdge. The building will be designed to LEED standards. Construction will commence in the summer of 2017 with delivery of the building in the fall of 2018. Please contact Lee & Associates to reserve a space in one of the most talked about new developments on the peninsula of Charleston!